The best assessment I’ve heard of the kit goes like this, “Its exactly what you thought it was going to be.” In many ways, this is a good thing, but when it comes right down to it, there is simply nothing, design-wise, to get excited about. It is thrilling to HAVE a kit now. A coach, many players, a world-class training facility and a soccer specific stadium on its way for the coming season. These are all things for the fans to celebrate and get excited about. The team we have all been waiting for is coming, and with each passing landmark, actual games are creeping closer and closer. We are incredibly lucky that the team was able to partner with a company that allowed their logo to be rendered in gold. So many teams around the world have their kits ruined by a terrible sponsor logo, a clashing color, or by having to sport a pyramid scheme across their chest. We have a respectable company, with heartfelt commercials. They have a simple, clean, horizontal version of their logo, and it’s in beautiful gold across the front. Three cheers to American Family for being a great partner. But overall, it’s a vertical striped kit. My complaints are really just nitpicks and some are even more about Adidas templates than this particular design. It’s a red shirt. Bah. I’m in the camp for minimizing red, and using it as a pin stripe or highlight. Think how Philly uses baby blue. I was really hoping for a black base with red stripes, as this would provide the richness and severity of aggression. Red is an entirely overused color in sport to the point of being cheap. The collar is just a plain black ringer with a sewn V-neck treatment; no stripes, lines, no work-friendly golf collar. The stripes, as one likely could have predicted, are simple. Thick black, thick red, clean edges, no pin stripes, no texture within the stripe, no design along the edges. I’m assuming we will get all of those additional features in future years, as they are required to update a jersey every year. The plain red back is bad. It looks like two different shirts were sewn together, one striped, one plain. There have certainly been some awful back treatments on striped designs, but to not even try is a fail. The widest two black stripes could have been run down the back, leaving room for the numbers. The stripes could terminate above and continue below the number. Something. At least the back got a jock tag with the cool 2017 logo from one of the first t-shirt designs. The Adidas stripes stopping at the sleeve hem is wonky. 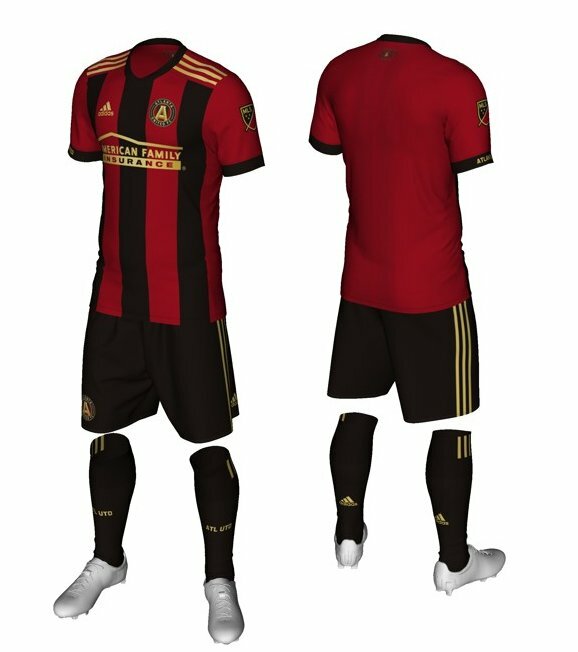 I would have preferred it having a gap for the MLS logo, and going all the way down the sleeve. The MLS logos and badge in their plastisized, textured style on the authentic are really nice and the only spot we’ve added much of any personality. The jersey is fine. It looks nice. I will scream at the top of my lungs for the guys wearing it. But it certainly ain’t “lit” or “fire” or anything of the like. Its’ simple, clean, and good. More than anything else, this jersey reminds me of how bad the name is and how much I despise red and black. We will never be the Oregon Ducks of MLS, we will never have a huge stylistic play, we will never be the boldest or most distinctive design in the store. It can certainly be argued that classic and plain are a good thing and we don’t want to look wild and crazy. But it certainly isn’t an option. And our name SO means absolutely nothing to anyone. In a city full of incredible history, we certainly cheaped out and picked a name with zero visualization. Here is looking forward to seeing what the away brings. 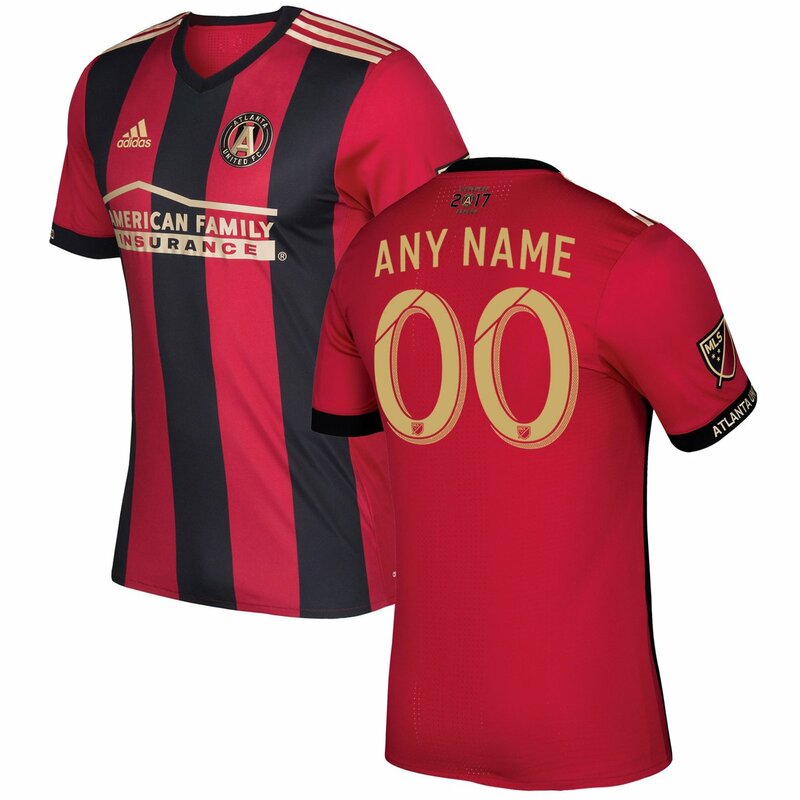 I’m hoping for zero white on it at all, like the majority of ATL UTD marketing. My fingers are crossed for a real collared shirt and LOTS of gold! JR is a frequent guest on the SoccerNomad podcast and you can follow him on twitter @paynomind.